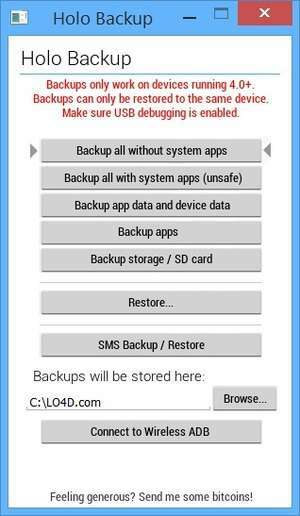 Formerly called "Simple ADB Backup", Holo Backup is a free utility which can backup the contents of an Android device without the requirement for root access. The application is easy-to-use and facilitates backup data up with just one click, but the phone or tablet must be running a version of Android 4.0 or above. USB debugging must also be enabled. Version 2.0 is a freeware program which does not have restrictions and it's free so it doesn't cost anything. For security reasons, you should also check out the Holo Backup download at LO4D.com which includes virus and malware tests. Additional screenshots of this application download may be available, too. 4.5 out of 5 based on 75 ratings. Holo Backup download been highly rated by our users.